When it first opened in 1857, Warsaw’s Hotel Europejski, a neo-renaissance palace designed by Henryk Marconi, was the grandest of its time. 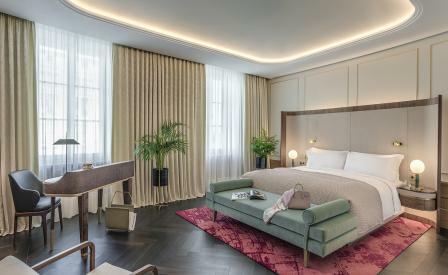 Enduring – for better or mainly worse – the many political upheavals that followed, the property, now part of the Raffles Hotels collection, has emerged from a painstaking renovation led by architecture firm APA Wojciechowski and Boris Kudlicka of local practice WWAA. Original details from cornicing to ceiling roses have been restored and updated with contemporary décor. Local craftsmen have etched the city’s skyline into the polished grey marble bathroom walls, which create a backdrop for silver-clad bathtubs; bedheads have been carved in richly grained burl; and Warsaw’s first humidor has been created.